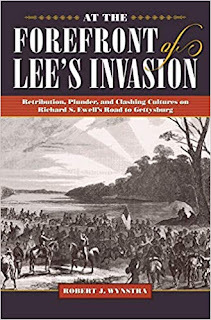 Robert Wynstra's At the Forefront of Lee's Invasion: Retribution, Plunder, and Clashing Cultures on Richard S. Ewell's Road to Gettysburg is a truly unique addition to the already vast and ever expanding Gettysburg Campaign literature. Not only does the book painstakingly recount the June 1863 military advance of Lt. Gen. Richard Ewell's Second Corps of the Army of Northern Virginia through Virginia, Maryland, and Pennsylvania, but it provides a remarkably rich documentation of Confederate requisition practices during the campaign and an almost daily record of interactions between their soldiers and the civilians in their path. There has been some precedent. While Kent Masterson Brown's epic 2005 study Retreat from Gettysburg: Lee, Logistics, and the Pennsylvania Campaign does devote a lengthy chapter to Confederate foraging operations during the march north, the book focuses primarily on the southern army's post-battle retreat and the fight to save its massive wagon trains filled with seized goods and supplies. Though also heavily concerned with military events, Wynstra's new study examines at great length and in unprecedented detail how and where those wagons were filled in the first place, at least from the Second Corps perspective. As already mentioned, on one level At the Forefront of Lee's Invasion is an impressive military history of the Second Corps's march north. In detailed fashion, the text closely follows Ewell's three divisions (those of generals Early, Johnson, and Rodes) and General Albert Jenkins's attached cavalry brigade from their Virginia encampments to the streets of Gettysburg. Wynstra's narrative treats with remarkable thoroughness the multitude of engagements fought along the way, those clashes ranging in size from the corps-sized Second Battle of Winchester down to tiny skirmishes between Confederate troops and hastily-assembled state militia. Also recounted are several instances of bushwhacking from unknown assailants. Ewell receives generally positive reviews from both author and source material for the general's first trial run as Stonewall Jackson's successor. The weakest link on the advance proved to be the cavalry, which operated with variable levels of discipline and generally failed to cut off retreating enemy forces when such opportunities arose. While the handful of maps contained in the volume are useful in tracing large-scale movements and familiarizing readers with the geography, it's unfortunate that no tactical maps were created for any of the actions described in the text, not even for the largest battle at Winchester. As well done as the military narrative is, it's the author's exhaustive study of the wary interaction between Confederate soldiers and the Maryland and Pennsylvania civilians they encountered in June that make the book shine brightest. Wynstra's writing also effectively contrasts the civilian reception that Second Corps received in ostensibly "friendly" territory as its columns moved north down Virginia's Shenandoah Valley. While supporters lined country roads and city streets in the early stages, providing food and refreshment aplenty, the local mood abruptly soured when Jenkins's cavalry and Rodes's infantry division entered Berkeley County, which had only recently broken away from old Virginia to join the new Union state of West Virginia. When Ewell's infantry spearhead (Rodes's Division) crossed the Potomac into Maryland, reception at Williamsport was frosty but was, while still mixed, much more positive in other municipalities like Hagerstown. According to Wynstra, many Confederate soldiers reported that their reception in western Maryland was far more enthusiastic in 1863 than it had been in 1862, the troops conjecturing that general unhappiness with federal occupation, conscription, and emancipation were behind the change. Other Rebels, however, remembering with bitterness the cold Marylander stares of not too many months before, were deeply mistrustful that any real change of heart had taken place. In their minds, any serious defeat in the upcoming campaign would result in the population reverting to their former attitudes. When the invaders finally crossed into Pennsylvania, they were without any doubt in the enemy's home ground. Aside from some rare scattered support from presumed Peace Democrats of the more extreme variety, the entire population was hostile, especially the region's many German farmers and townspeople. These Pennsylvanians, the hated "Dutch," were especially appealing targets for Confederate foraging. Though Wynstra does not specifically devote any chapter to the "clashing cultures" referred to in the volume's subtitle, there are several culturally-themed threads that can be teased from the narrative. The more hostility the population exhibited toward the invaders the more the inhabitants were described by the Confederates in their writings as dirty, uncouth, and just plain ugly. The language of cultural and ethnic superiority employed is remarkably similar to that used by Midwestern Union soldiers when describing the isolated rural populations of Missouri and Arkansas. Curiously, many Confederate officers and men recorded their disappointment that so many northern citizens proved to be so submissive to their requests and demands, viewing their lack of open defiance as unmanly (for the men anyway), degraded, and lacking in pride. Just how much this viewpoint was a product of southern slave culture is more implied than discussed at depth in the book. The southern attitude is in marked contrast to how northern soldiers tended to view openly defiant southern civilians as hardened Rebels and all the more fit for aggressively punitive action. Southern soldiers also frequently remarked at the material wealth of the Pennsylvania farmers not being matched by any behavioral refinement, reinforcing the traditional stereotype they had of northerners valuing money above all else. As Wynstra observes, it seems not to have occurred to any of the Rebels that the widespread prosperity that impressed them so much in Pennsylvania might have been better attributed to the advantages of the North's free labor system. According to Wynstra's findings, Lee's strict orders against entering homes without authorization, targeting private property (beyond the regular requisitions), and committing acts of retaliation for real and perceived wrongs committed by Union armies in the South were closely followed in the overwhelming majority of cases. Of course, exceptions were unavoidable and there were isolated criminal acts, but Ewell's subordinate generals were remarkably consistent in enforcing Lee's edict, by which it was hoped that the Confederate Army could irrefutably demonstrate to the rest of the world the contrast between barbaric Union outrages and civilized Confederate restraint when it came to conducting themselves in the enemy's country. Establishing the moral high ground in this regard would also provide their enemies with no additional ammunition to use against the growing peace movement in the North. For every town and city occupied by the Confederates during this phase of the Gettysburg Campaign, the author was able to amass a considerable collection of firsthand accounts from both sides, and together these documents help construct a remarkably well-rounded perspective.In every urban center they entered, the Confederates readily requisitioned needed items from stores and businesses, paying for items taken like food, clothing, horses, and livestock with Confederate paper money or receipts. Such forms of "payment" offered some semblance of defense against accusations of outright theft, but also cleverly made the merchants and citizens to some small degree beholden to Confederate victory in the war. Considering the army's lack of experience in operating in true enemy territory, the process was surprisingly orderly, with the officer in charge typically successful in negotiating terms with city leaders that would avoid soldiers entering private homes to obtain what they needed. Even the victimized citizens, who were understandably angry and frustrated with their often very considerable personal losses, were consistently forced to concede that the enemy troops generally respected private property of non-military value, avoided wanton acts of destruction, and behaved far better than expected. That said, Wynstra's research reconfirms the uncomfortable truth exposed by other scholars and writers before him that Confederate units, in particular Jenkins's cavalry brigade but also men from all three infantry divisions acting with the tacit approval of their commanders, actively hunted for escaped slaves in Maryland and Pennsylvania to send back south for repatriation or profit. In the process, they also kidnapped numerous free blacks, only some of whom were released when local citizens were able to provide convincing evidence of their status. This pattern of behavior was a jarring exception to the general rule of retaliatory restraint exhibited by the men of Lee's army, who had the June 11 burning of Darien, Georgia fresh in their minds along with similar memories of innumerable other acts of wholesale destruction perpetrated by Union forces in the South. On the whole, if Second Corps is any indication of how the rest of the army conducted itself, it's difficult not to come to the conclusion that Lee's command during the Gettysburg Campaign was exceptionally well disciplined in comparison to how other principal Civil War armies of the mid-war period and beyond treated white civilians and their property. However, due caution is in order before drawing any kind of broader conclusions from this. For one thing, the sample size of a major Confederate army operating in true northern (as differentiated from Border State) territory is only one, while numerous Union armies crisscrossed the south on countless occasions at every stage of the war. Additionally, there's no way to reasonably predict how southern armies might have conducted themselves if they, like their Union counterparts, were forced to engage in sustained occupation duty and active campaigning deep inside the enemy's homeland for years at a time. Getting back to the Second Corps during the Gettysburg Campaign, it might also make for a useful point of comparison to examine the behavior of Ewell's men during the retreat, as the literature offers countless examples of enhanced mistreatment of civilians at the hands of recently defeated Civil War armies. The first truly extensive account of large-scale Confederate foraging and impressment activities in the North, At the Forefront of Lee's Invasion is not only an essential addition to the modern Gettysburg Campaign library but an important new resource for those studying the interaction between Civil War armies and the hostile civilian populations that were forced to supply their needs and wants in the field. It is highly recommended.